Though not quite a motel per se, the Pueblo Hotel and its swimmer on top of the marquee is an example of the type of motel signage that used to be quite prevalent, especially in the hot and dry areas of the Southwest. The Pueblo sign was first established in 1948. The hotel has been closed since 1984. Here's another of the Route 66 motels in Arizona, this one built in 1952. 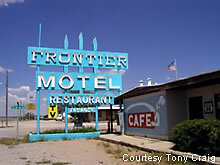 The Frontier Motel features a marquee that's freshly painted from time to time, the most recent in 2002. Check out this great sign for the Yuma Cabana Motel. Services are said to be great also, for this Yuma, Arizona landmark. This motel is a can't miss sight along the main drag through town. 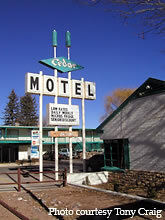 The Cedar Motel in Snowflake, AZ features its roadside motel sign worthy of the main drag that it is located on. This neon sign for the Butterfield Stage Motel is a real dandy. Check out the lit up horse drawn carriage. 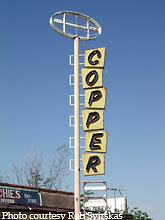 At left is the marquee for the Copper Motel in Superior, AZ. Parts of the sign are now missing, somewhat common for some of these old signs. Here's a marquee combining a bit of old with new. 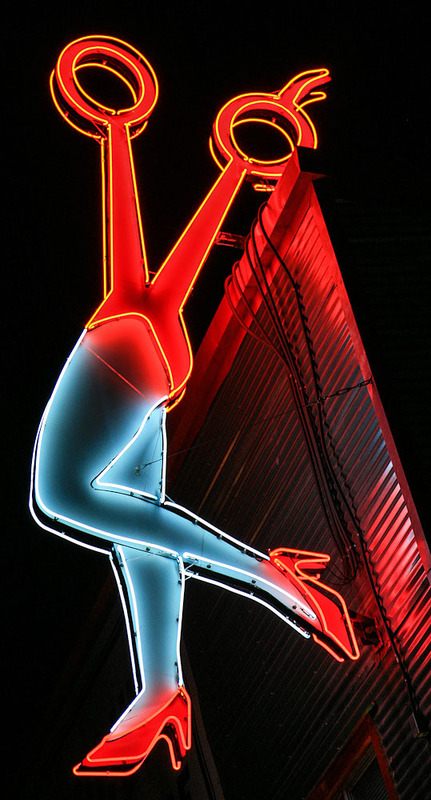 The sign at the Skyline Motel in Prescott itself is backlit plastic, but the colors and swooping arrow hearkens back to the day when neon motor court signs were all the norm. The Mile Hi Motel still stands along the roadside, looking for the wayward traveler.